Crude oil development and production in oil reservoirs can include up to three distinct parts: primary, secondary, and tertiary (or enhanced) recovery. 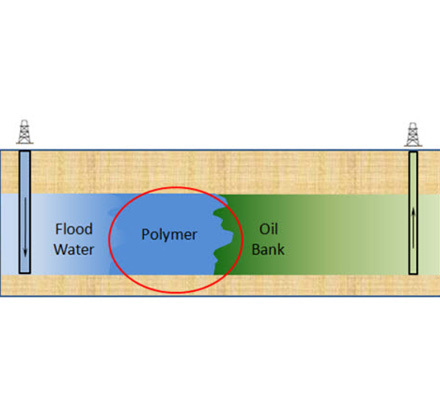 One of the most important use of polyacrylamide is in subsurface applications such as enhanced oil recovery (polymer flooding), where high viscosity aqueous solutions are injected to improve the economics of conventional water flooding. For oil extraction applications, polyacrylamide is used to increase the viscosity of water to improve the effectiveness of the water flooding process. A polymer solution is more viscous than brine without polymer. In a flooding application, the increased viscosity will alter the mobility ratio between the injected fluid and the reservoir oil. The improved mobility ratio will lead to better vertical and areal sweep efficiencies and thus higher oil recoveries. Polymers hve also been used to alter gross permeability variations in some reservoirs. In other words, the PAM-injected solution assists in sweeping (or pushing) oil locked in a reservoir towards a production pump. The result is improved volumetric sweep efficiency – more oil is produced for a given volume of water injected into the well. Historically, polyacrylamide oilfield projects primarily used polyacrylamide supplied as a solid powder. This powder is then hydrated to form an aqueous solution. More conveniently, most polyacrylamide oilfield projects now use polyacrylamide supplied in emulsion form as liquids, offering a more efficient and faster way to get the PAM into the aqueous solution. Due largely to early adoption, Chinese polyacrylamide producers are the worldwide technological leaders with respect to the chemical compound’s usage in enhanced oil recovery. Not surprisingly, Chinese demand accounts for most of the world's consumption in this application. Sinofloc has more than ten-year experience in this line. Sinofloc polyacrylamides can offer prospects for ultimately producing 30-60 percent or more of the reservoir’s original oil in place and have been found to be commercially successful. To learn more information on EOR product please contact us marketing@sinofloc.com.